At no point in history were you more capable of teaching yourself anything than today. Picking up new skills has become as easy as firing up Google, doing some research, practicing in the right ways, and pushing yourself through the plateaus. But despite this incredible access to information, few people take full advantage of the opportunity they have for self-directed learning. We’re stuck in the myth that to learn something you need to be educated on it when you’re perfectly able to educate yourself. It’s no longer necessary to get a college degree to be qualified to do something, and while big, old companies haven’t realized that yet, it’s common wisdom in smaller, more forward-thinking startups. Plenty of successful people today got where they are today by teaching themselves the skills, and there’s no reason you can’t do the same. Self-education can free you from a job you hate, from a college major you aren’t excited about, and it will be a core skill for the 21st century. Your ability to respond to changes in the landscape of work and technology will be dictated by how skilled of a self-educator you are. How well you can take full advantage of the information available to you to grow your skillset. I started studying how to learn outside a classroom around my sophomore year of college and primarily focused it to marketing and writing. Over the years of teaching myself new things, and now interviewing other people who have done the same, I’ve honed in on a method for educating yourself on anything. If you follow this process, there’s no reason you can’t take yourself from novice to expert in any skill or topic without a college’s help. It starts with rethinking how we actually learn. In high school, college, and most forms of higher education (in the United States, at least) the model of learning you operate in trains you to stop figuring things out for yourself and expect information to be handed to you. How “well you do” in school is based on your grades. Your grades are based on your test scores, papers, and projects, which are based on how well you apply information that was handed to you. For at least twelve years, you’re trained to regurgitate and apply information that’s pre-packaged for you but never trained to find that information on your own. There are no classes where the professor shows up and says “figure out how to build a website by tomorrow,” and then leaves. It’s more likely that you’ll be taught one way to build a website (probably using some awful tool like Dreamweaver) and then expected to follow the steps you were shown. But that’s not how learning works in the real world. If you want to do anything remotely independent (entrepreneurship, creative work, freelancing, writing, lifestyle businesses, etc.) then you have to be able to figure things out without being handed the knowledge beforehand. If this sounds like “guess and check,” the process that some teacher probably told you was “bad” at some point, that’s because it is guess and check. And it’s a magnitudes better method than expecting to know the solution to your problems beforehand. When you teach yourself something on your own, there’s no curriculum, no playbook, no textbook, no professor to walk you through the steps. You move from one problem to the next slowly getting better at guessing and checking. You don’t need a formal education in a subject, you just need the ability to experiment, push your abilities, and respond to feedback. The sandbox method is an ongoing process for self-education, based on the latest scientific research on how we learn and how we process information. It recognizes that we don’t need to memorize facts, formulas, or other minutiae anymore. Instead, we need to develop an intuitive understanding of our skills, expose ourselves to a broad swath of information about the skill, and constantly push ourselves to improve. It can be done on your own, with a mentor, in school, in a company, any time. It’s a process for continual learning and improvement, broken out into four cyclical steps. Before doing any research on how to do, or how to better do, what you want to learn, you need to create an environment to practice it in. 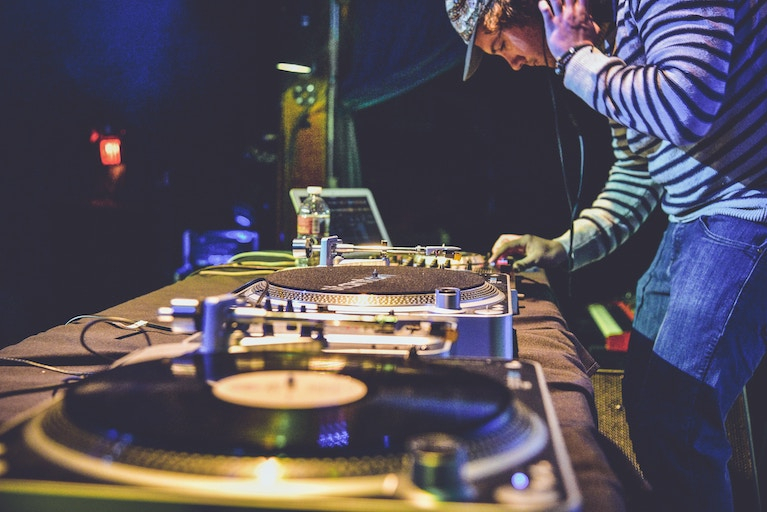 You’re going to spend most of your time practicing and experimenting, not studying, so you need a way that you can easily exercise your skill and improvise. This is your “sandbox,” an area where you can freely play around with the skill you’re trying to learn without having to worry too much about taking it seriously. The sandbox lets you explore, experiment, and fail, without staking your entire future, savings, or reputation on it. It’s an ideal environment for rapid learning. Programming: Accounts on Github, Heroku, and StackExchange for building projects and asking for help. Writing: A personal blog hosted on WordPress, Medium, or SquareSpace. Photography: Your camera and Instagram account. Design: Sketch, and a Dribbble account to show your work on. Marketing: A blog or information site hosted on WordPress that you can try to grow. Whatever you want to learn, this sandbox must be in place before you get started. If you don’t have an easy way to practice whatever you’re trying to learn and to put your work out in the world as you’re going, then you’ll learn much slower and have a harder time getting feedback. Putting your work out there when you’re a novice is scary, but it will train you to get comfortable with having people see your creative projects before they’re perfect and before you’re an expert. School trains students to be afraid of the judgment of their work from being graded all the time, but if you can get over that latent fear and start sharing what you’re working on with the community around your skill, you’ll advance much faster and make useful connections along the way. With your sandbox in place, you can start researching and learning more about your target skill. To continue expanding the borders of your sandbox, the extent of the skill that you can practice and apply, you’ll need to do a certain amount of research. The resources exist online to teach yourself anything, you just have to figure out what’s worth reading, watching, or listening to. In the beginning, the best kind of information to look for is recipes. Clear ways of using the skill that you can immediately incorporate into your sandbox and try out. If you don’t practice what you’re reading (on your own, not just in the confines of the education platform like Codecademy) then you’ll never truly learn it. I love books as a learning resource. I’ve used them to improve my photography, get better at marketing, learn how our minds work, learn how to learn, and many people swear by books as a self-education resource. They’re great for picking up broad techniques and mental models for certain skills and can be invaluable introductions to new parts of the skills that you might not have thought of. You can also use books for harder skills like programming. At least one person I’ve spoken with taught himself how to program primarily through textbooks until he knew enough to figure out problems on his own using StackOverflow and the debugger. They can also be great for improving your language skills, both by teaching you how to be a better language learner and helping you learn the intricacies of a language’s grammar. You won’t learn proper pronunciation or how to listen to a book, but they can be useful resources for mastering the finer points. Whatever you’re trying to learn, books are a great resource to start with since they’re generally more vetted and edited than what you can find online. But there are still plenty of great, sometimes better, resources to be found on the Internet. Some of these resources will explain specifically how to do something, and some, like the ones listed above, will help you navigate everything else out there. If you’re trying to navigate the Internet’s vast collection of self-education resources, finding a good blog article or online resource that can cut through the noise is a huge boon. The easiest way to find these is to simply Google “how to do X” or “how to learn X” or “how to get better at X.” You’ll typically find a good article, discussion on Reddit, or related question on Quora that you can dig through to get started. If you prefer watching and listening to reading, then online courses or “MOOCs” are a perfect solution for self-education. The Internet is full of free and paid online classes that can teach you anything from programming, to marketing, to design, to (I assume) basket weaving. Some colleges, even, have opened up free recordings of their courses. You can go through MIT’s OpenCourseWare, Harvard’s open learning, and free class recordings from tons of other universities. There are also great dedicated platforms for online courses. I personally have used SkillShare, Khan Academy, Coursera, Codecademy, and Udemy. There are also plenty of amazing teachers on YouTube (like this Ruby on Rails series), teachers on Teachable (like Tiago Forte), and teachers who have built their own schools from scratch (like Wes Bos). Many of these materials can be expensive, but there are plenty of free online courses too. And some of the free ones are better than the paid ones. Check out highly viewed YouTube channels for skills you’re trying to learn, and look at free university recordings and TED talks if you want to learn a subject. In many cases, these freely distributed courses are the best resources out there. As you’re learning, take notes on everything so you can refer back to them later. I like using Evernote and keeping highly detailed notes, since this makes it easy to find things that I’ve learned in the past and exactly where I’ve found them. It helps you remember everything, too, by building up a “personal wiki” in the words of Andy Hunt. You should also consider publishing your notes as you go (as I do with books I read) since that forces you to clarify your understanding and articulate it in a way that other people will understand. Within your sandbox, how you practice what you’re learning will be as important as what you choose to practice. The wrong practice methods can lead to hours, days, even years of wasted repetition, but the right practice methods can accelerate you to the level of competency in a matter of months. The ineffective practice that most people engage in is called “naive practice,” named by Anders Ericsson in his book Peak. Naive practice is how most people trick themselves into thinking their practicing, while really, they aren’t learning anything. Playing a competitive game like Go casually with a friend. Playing songs that you already know how to play. Looking up a recipe, baking a pie, and then keeping making that kind of pie in the future. The problem is that in this kind of “practice,” you’re not challenging yourself. If you go through the motions of naive practice, you’ll likely improve very little, if at all, so you have to incorporate the elements of purposeful and deliberate practice to make sure that you’re truly learning while you’re practicing. Honestly assess your limits to figure out where you need to improve. Set a goal just beyond your current ability to motivate yourself to stretch beyond your comfort zone. Get feedback, in whatever way you can, and incorporate that feedback into your practice. Getting feedback will be the last part of our self-education system. 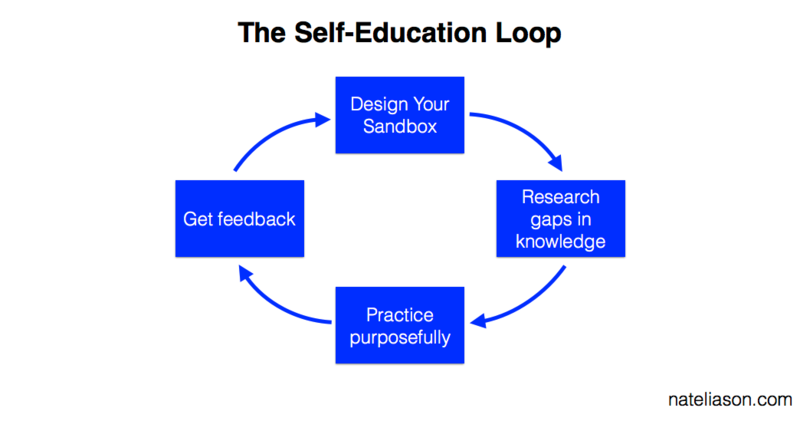 As you practice deliberately within your sandbox, continuing to do research to fill in the gaps of your knowledge, the last (and necessary) piece of the self-education process is getting feedback. If you’re trying to improve your weightlifting, it’s hard to know if your form is good or not without a coach there to give you corrections. When you’re learning a language, it’s hard to know whether you’re pronouncing words correctly without someone to critique you. You can learn a lot on your own, but without a coach, mentor, or tool to provide feedback, you’ll get stuck eventually. Or, worse, you might keep ingraining bad technique, making it harder to unlearn later. For some skills, you can find online tools that will give you feedback. Sites like Codecademy tell you what you did wrong, and quizzes on more education-heavy sites like Coursera check your comprehension as you’re doing. There are also online communities that have good systems for giving each other feedback. There are free, community feedback systems like reddit’s /r/learnprogramming for getting coding feedback. There are also more enforced feedback-sharing sites like Lang-8, where you give feedback to people trying to learn your language in return for feedback from people whose language you’re trying to learn. But the best form of feedback is always a coach, tutor, or mentor who already knows how to do what you’re trying to learn. They’ll be able to provide the most targeted feedback, and if they’re good, they’ll be able to preempt your plateaus and give you ideas about how you can design your learning program to avoid them. If you don’t have anyone who can coach you in person, try finding someone online. If you want to be a better writer, hire an editor on UpWork to give you feedback. If you want to get in shape, find an online service focused on improving your weightlifting abilities. If you want to learn a new language, find someone on iTalki that you can have conversations with. You could also reach out to someone you look up to and ask for small bits of advice. They won’t give as much hands-on coaching, but they can still be incredibly helpful. Another option is to use less direct forms of feedback. The market can be one good feedback loop, since if you’re regularly publishing art, writing, photos, music, you can get a sense for what people like and don’t like based on what they respond to. Be careful with this method, though. Sometimes you’ll get pulled in the direction of mass appeal instead of best work. Fifty Shades of Grey is one of the best-selling books of all time… but it’s not exactly a literary work to model your writing off of. Once you’ve gone through the process of designing your sandbox, researching how to improve your skill, applying that knowledge to purposeful practice within your sandbox, and getting feedback on your work as you’re going, you simply repeat the process to continue developing your skill. When you reach a learning goal, or feel like you’ve become comfortable with an aspect of the skill, you have to go back to the research phase to assess what else you need to learn, adjust your sandbox to allow you to learn that skill effectively, then purposefully practice it and solicit feedback to keep pushing yourself beyond your comfort zone. Finally, it’s possible that you’ll eventually get stuck somewhere. When that happens, you have to assess what the problem might be. Did you reach a point of “good enough” and plateau? Then you need to learn how to bust through learning plateaus. Have you lost motivation and stop practicing? Then you need to learn how to build a self-perpetuating motivation machine. Are you practicing diligently, but not improving? Then you may need to get a better understanding of how to practice purposefully and deliberately.